The end of summer didn’t just see the end to hot weather and ice cream, but it also saw the end of the line for Emmerdale serial killer, Lachlan White, who faced a future behind bars. But in case you missed all of that, here’s what happened in Emmerdale during September. The biggest story this month was the climax of Lachlan’s story and his demise. As his secrets unravelled, Lachlan was forced to confess all to Belle and was still deluded enough to believe they could start a life together away from the village. Actor Thomas Atkinson was the glue holding this over-stretched story together as his performances made Lachlan both chilling and blackly comic. He was a joy to watch and his onscreen chemistry with Eden Taylor-Draper (Belle Dingle) and Ryan Hawley (Robert Sugden) gave us some stand-out scenes. Emmerdale also kept us guessing, pulling out the twist of Belle being hit by Robert’s car, but sadly after this high drama week, it all fell a bit flat. The weakness of Lachlan’s story – much like Emma’s last year – came from dragging out the story far too long, stalling for time and giving us too many filler repetitions. 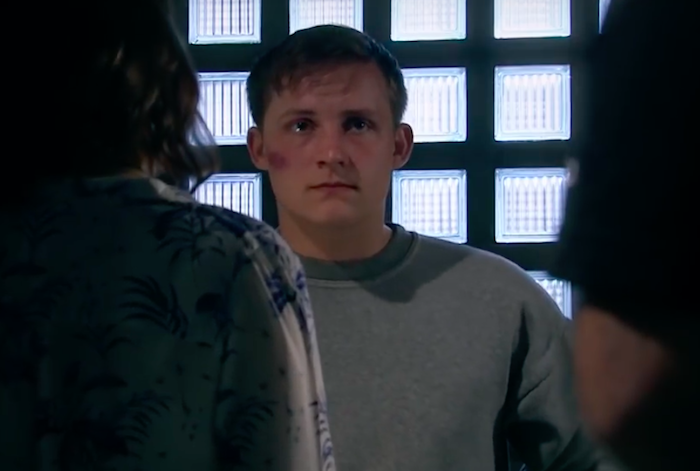 Lachlan’s final episodes, which saw him locked up for life, came as such an anti-climax that many viewers are still left wondering – was that it? It seemed like a real damp squib of an ending, especially when we lost a great character like Gerry Roberts (Shaun Thomas) in the process, and Lachlan follows Emmerdale serial killing legends like Cameron Murray. Another star in Emmerdale’s midst was Emma Atkins, once again, who gave award-winning performances as Charity Dingle faced Bails for the final time. Emmerdale have made some odd choices in the telling of Charity’s storyline (such as rushing through the trial and the introduction of Charity’s dad) and it’s been disappointing to see how little involvement the Dingle family have had, but through it all, Emma’s performances have been captivating. One of the most effective scenes of the trial week was Charity’s conversation with Cain Dingle outside the courthouse as the two reflected on her achievements and the journeys they’ve both been on. It’s this type of soap history and investment that makes it so rewarding to be a soap fan. Thank god for Vanessa Woodfield (Michelle Hardwick) in Charity’s life too, because she’s really needed someone to be her rock and it looks like she’s found her. It wasn’t all familiar faces that made waves this month, as newcomer Ellis rocked up in the village and made a big impression on Victoria (Isabel Hodgins) and Matty Barton (Ash Palmisciano). Not only did Ellis’s arrival trigger more complicated feelings between the confused friends, but he also caused turmoil for Jessie Grant as she was forced to admit to keeping secrets from Marlon Dingle (Mark Charnock). Ellis already feels at home with actor Asan N’Jie bringing buckets of warmth and charisma to the role. His presence in Jessie’s life has also made her feel more of a character than just a bit-player in Marlon’s stories. There’s no doubt that her son Billy is going to cause havoc when he inevitably arrives in the village! Jessie wasn’t the only one to have dark secrets exposed this month, as Moira Dingle confessed to Matty and Victoria that she’d killed Emma and let son Adam take the rap. I was thrilled to revisit this story as not only does it give Vic more to do (although I do love her sparks with Matty) and it only feels right to explore the impact on her and Moira. Plus, Natalie J Robb is far too talented just to be sat in Butler’s kitchen doing very little! The swoon-worthy Doctor Cavanagh had more to do this month as he began flirting with a very interested Bernice Blackstock (Samantha Giles) and I am more than happy to see her ditch dull Daz Spencer (Mark Jordon) for the dishy Doc. Can’t wait to see how this progresses. Love was in the air for Joe Tate (Ned Porteous) and Debbie Dingle (Charley Webb) too, as they got engaged but trouble is around the corner now that Joe had forged her signature on the pre-nup and Graham Foster (Andrew Scarborough) keeps making mysterious phonecalls. With Kim Tate’s return on the horizon, let’s hope things get interesting fast! I can’t talk about September without writing about the utter ridiculousness that was the “Where is Rebecca White?” conclusion. It was farcical beyond belief with more questions than answers and resembled something from an American soap, especially her ghostly re-appearance in the graveyard. Laughable! Emmerdale should be better than that. Understandably after her torture and captivity, Rebecca’s struggles are greater than ever and it was all a bit grim. But now that Ross is offering Rebecca a glimmer of hope, it finally feels like they’re writing Rebecca with more depth than ever before. Could this now be the turning point for the character? We’ll soon see! Now onto October, infamously a big month in soapland. What can we expect? If the teasers are anything to go by, then a long awaited wedding, tragedy, a dramatic return and plenty of shocks. I can’t wait to see what’s coming!